Baskin-Robbins is making it easy for guests to enjoy its new Iced Cappy Blast while helping to make a difference in their local communities. The Iced Cappy Blast is a rich and creamy coffee-flavored iced beverage that is the ultimate pick-me-up any time of day. Guests can also "add a boost" of extra cappuccino flavor or “make it mocha” with the addition of rich chocolate syrup. To help encourage guests to participate in the promotion in an even more affordable way, the new mini Iced Cappy Blast – a 12 oz. version of the iced beverage – will be available for just 99 cents every Wednesday in April. ** All Baskin-Robbins’ beverages are now available in four sizes: mini (12 oz. ), small (16 oz. ), medium (24 oz.) and large (32 oz.). Since 2007, Baskin-Robbins has had a national partnership with Feeding America through The Dunkin’ Donuts & Baskin-Robbins Community Foundation (DDBRCF), which serves the basic needs of local communities through food for the hungry, safety and children's health. Over the past four years, the DDBRCF has donated nearly $1 million to support local food banks and Baskin-Robbins franchisees have led food drives in the communities they serve and have organized volunteer days at their local food banks. To find out what local food banks will benefit from the promotion, visit Feeding America’s food bank locator at http://feedingamerica.org/foodbank-results.aspx. 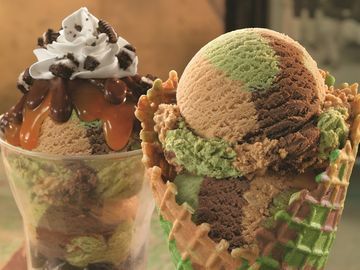 For general information about the promotion, visit www.BaskinRobbins.com or follow Baskin-Robbins on Facebook (www.facebook.com/BaskinRobbins) or Twitter (www.twitter.com/BaskinRobbins). * The monetary equivalent of a meal will be donated up to 500,000 meals for every Iced Cappy Blast sold in April and for every new “Like” Baskin-Robbins receives on Facebook, up to 500,000 “Likes.” Each $1 donated helps Feeding America® provide ten pounds of food and grocery products, or the equivalent of eight meals, to someone at risk of hunger. ** The mini Iced Cappy Blast is available for 99 cents every Wednesday in April, plus applicable tax. Feeding America provides low-income individuals and families with the fuel to survive and even thrive. As the nation's leading domestic hunger-relief charity, our network members supply food to more than 37 million Americans each year, including 14 million children and 3 million seniors. Serving the entire United States, more than 200 member food banks support 61,000 agencies that address hunger in all of its forms. For more information on how you can fight hunger in your community and across the country, visit http://feedingamerica.org/. Find us on Facebook at http://www.facebook.com/FeedingAmerica or follow our news on Twitter at https://twitter.com/#!/FeedingAmerica.